Do you hate soap scum as much as I do? We have an older fiberglass tub that seems to collect soap scum like the dryer collects lint. Keeping it clean was a monumental chore, not to mention the chemical odors that always seemed to linger in the space. Well, no more. We have tried out the homemade natural alternatives to find which work best in every situation. 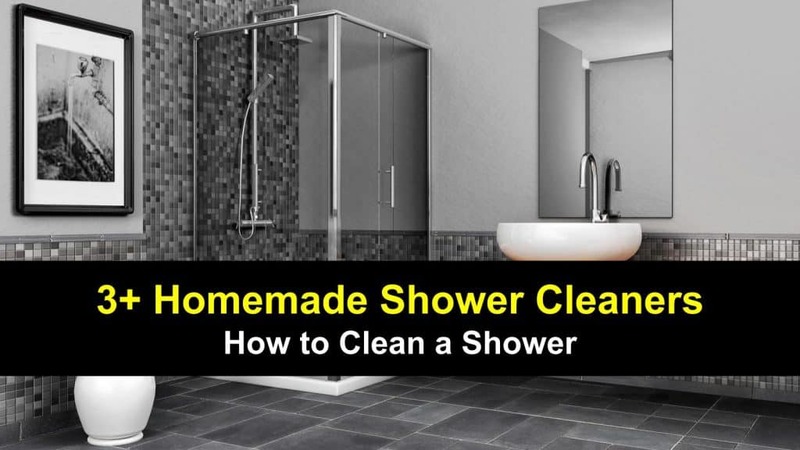 In this article, we’re going to go over homemade shower cleaners. We’re going to look at homemade shower and tub cleaners, and homemade glass shower door cleaners. I have found these recipes work well to get the tub and shower clean. I really enjoyed making and using my own natural cleaners. I know exactly what is in them and that I am not exposing my family to any toxic chemicals. I hope these tips help you as well. What is the Best Homemade Shower Cleaner? This homemade shower cleaner spray uses white vinegar as an acid base to remove hard water stains, dish soap to cut through the grease and soap scum, and essential oils to prevent fungus and bacteria from growing on those damp surfaces. They also work well to prevent the mold and mildew that always seems to creep into cracks and crevices. You can make this cleaner without the essential oils if you don’t have them, but their natural antibacterial and antifungal properties make them valuable additions. This mixture also works well as a glass shower door cleaner and simple homemade window cleaner. Mix the ingredients up in a spray bottle, preferably glass, and give them a quick shake before every use. Plastic bottles will work too, but the essential oils in the mixture will degrade a plastic spray bottle over time. You will need at least an 8-ounce bottle with a spray nozzle. To use our homemade tub and shower cleaner, spray the cleaner generously over the entire surface of the tub and shower surround. Let the cleanser to sit for 5 to 10 minutes while you clean the rest of the bathroom. 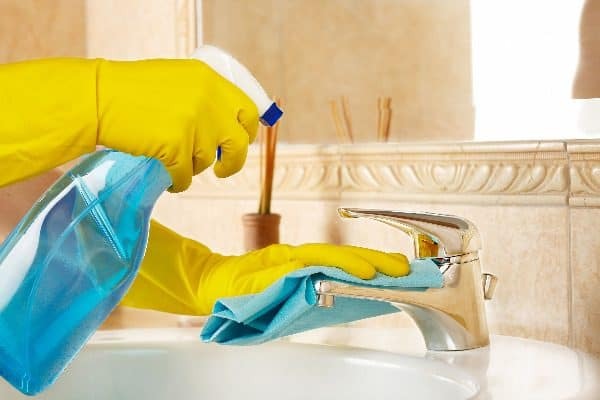 Wipe the tub and surrounding surfaces with a clean rag or a sponge. Use regularly for best results. This homemade shower cleaner spray recipe is easy to make and use. You can just spray the shower walls down after the last shower of the day and leave it to do its work. No wiping or scrubbing required if you use it daily. This recipe makes a quart of cleaner, meaning you’ll need a large spray bottle. Glass bottles work best here also, but you can certainly use a plastic one if that is all you have. This recipe relies on the combination of hydrogen peroxide and rubbing alcohol to kill germs–and believe me; it does the job. The jet dry removes hard water stains from glass surfaces and makes your shower surface shiny clean. Try this recipe as an everyday spray, and you’ll soon be enjoying a perfectly clean shower without the scrubbing. Mix all of the ingredients in a spray bottle and shake before each use. After the last shower of the morning or evening, spray down the shower surfaces and walk away. Repeat daily for a reliably clean shower. For tough stains or mildew you may need to apply some elbow grease to get them clean, then keep them clean with the daily shower sprays. Here are the best ways to clean these tough stains. Use baking soda with just enough added water or vinegar to make a thick paste. Scrub tough stains with this mixture on an old toothbrush or other small brush. For the best DIY grout stain cleaner, use the baking soda mixed with hydrogen peroxide and scrub the grout line with a toothbrush. The hydrogen peroxide gently bleaches the grout while the baking soda applies some abrasive to scrub away the stain. To get an even more powerful cleaner to unclog your shower drain, see our how to unclog a shower drain tips. This is a good and inexpensive homemade bathroom cleaner that works for more than just the tub and shower. It has heavy duty cleaning ability from the soap, borax, and washing soda and the essential oils disinfect while giving it a pleasant smell. To use, place all of the ingredients into a spray bottle and shake well. Use this cleaner to wipe down the tub, shower surround, countertops and outside of the toilet bowl. Wipe off with a clean towel. I prefer microfiber towels for cleaning; they seem to trap small particles best. This cleaner also works well to clean tile floors and wood cabinets. Over time, scratches and stains collect in fiberglass tubs and shower and keep it from looking clean. 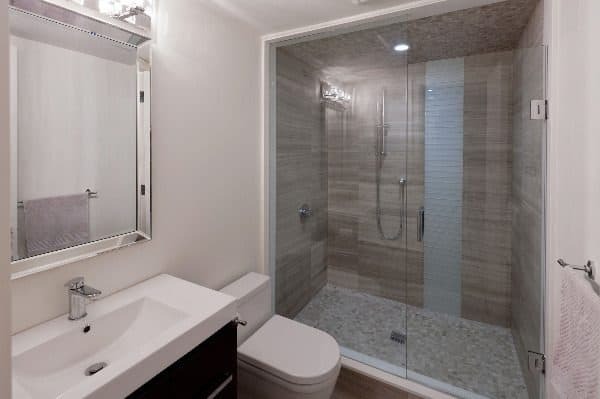 However, you can prevent many of these scratches and stains by proper cleaning techniques for fiberglass shower, and tub surrounds. All of the homemade tub and shower cleaner recipes we have recommended here are suitable for fiberglass and tile. It is important to use non-abrasive cleaners and avoid scouring powders and other abrasive compounds. Abrasive cleaning products can leave small scratches on the fiberglass surfaces, which mar the surface and become places for stains to take hold. Likewise, use a soft sponge or cloth to apply your cleaners. Nylon scrubbers and abrasive sponges scratch the surface. Allow the cleaning solution time to do its job. Spray it on, then move to other cleaning jobs. Come back later and rinse the cleaning solution away and dry the surface with a towel. A lot depends on your situation. If you live in an area with hard water or where iron stains are a common problem, you might prefer the vinegar based cleaner used daily. In other areas, the all-purpose cleaner might work best. Give them a try and choose the one that best fits your cleaning style and habits. 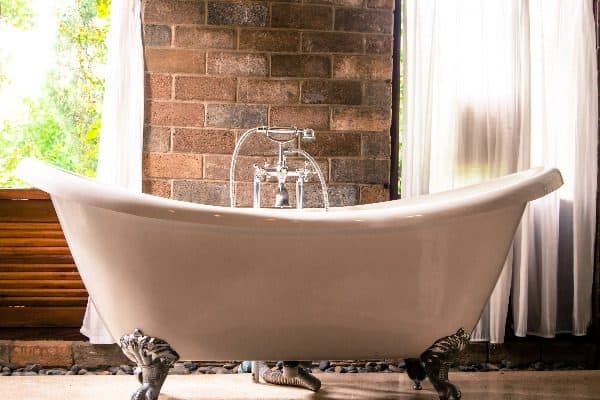 I feel sure that these cleaning solutions will help you keep your bathroom sparkling clean without using harmful chemicals. Which one is your favorite? Or perhaps you have another solution that you prefer. Let us know in the comments so that everyone can benefit. In this article, we went over homemade shower cleaners. 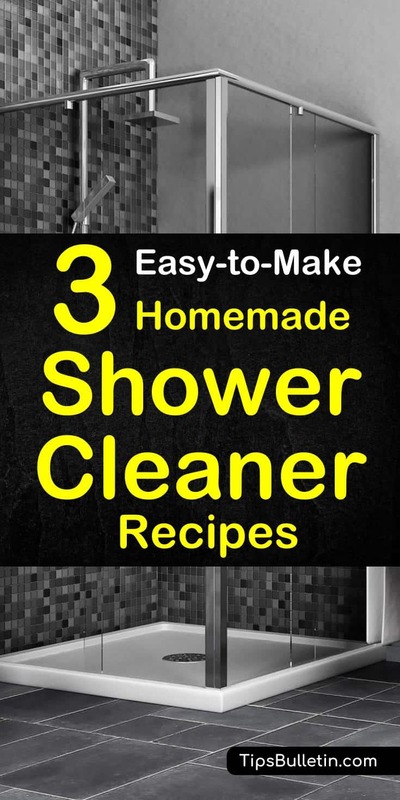 We covered multiple simple easy-to-make recipes for homemade shower and tub cleaners and homemade glass shower door cleaners. Hopefully, these tips and recipes will reduce the amount of time spent cleaning so that you have time to enjoy your family and friends. If you found them helpful, consider sharing them on social media and spreading the word.